During this years PlayStation Experience 2016 Square Enix has revealed more details about what you can expect from the new NieR Automata game which will be launching on PlayStation 4 on March 7th, 2017 and is currently in its final stages of development by Square Enix. A new trailer has been released during the PS Experience revealing a little more about what you can expect from the game which is available in both a Black Box Edition and Day One Edition for PS4 comsoles. Francis Santos from Square Enix explains more about what you can expect to be included in the Day One Edition of NieR: Automata. 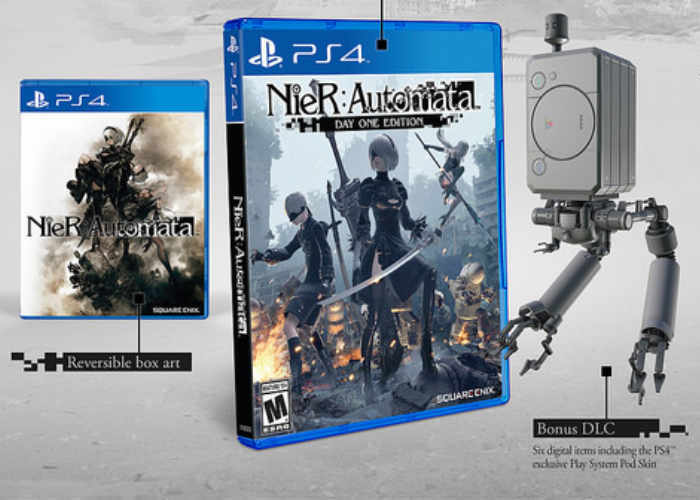 For gamers in search of exclusive items to complement the fast-paced action, we’re proud to present the Nier: Automata “Black Box Edition,” exclusive to PS4. Back at E3 2016 we showed off a prototype of the 2B statue during our Square Enix Presents livestream. Seeing the fully developed statue here and how awesome 2B looks, it brings an android tear to my eye. Copies will be limited, so be sure not to miss out as the “Black Box Edition” will be available exclusively at the Square Enix Online Store. • A sleek black Collector’s Edition box housing the below exclusive content. • The Nier: Automata game. • Exquisitely crafted YoRHa “2B” Figurine. • Hardback 64-page artbook detailing the stunning artwork and illustrations from the game. • Exclusive steelbook case featuring artwork from renowned Akihiko Yoshida (Final Fantasy XIV / Bravely Default). • Hauntingly beautiful soundtrack containing 13 live recorded songs from Nier and Nier: Automata, composed by veteran Keiichi Okabe from Monaca, Inc. (Tekken / Drakengard / Nier). • All Day One Edition digital content, including: Machine Mask Accessory, Grimoire Weiss Pod, Play System Pod Skin, Retro Grey Pod Skin, Retro Red Pod Skin, and Cardboard Pod Skin. The Day One Edition includes amazing digital bonus content and a reversible box art featuring character illustrations from Akihiko Yoshida. The in-game Pod Support System is useful both in and outside of battle, and can be enhanced throughout the game. The Day One Edition comes with some great pod skins, including designs that are reminiscent of consoles from eons past.